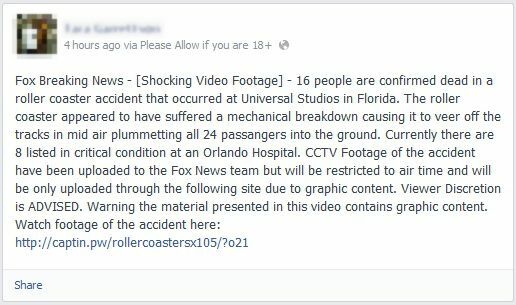 Analysis: No such roller coaster accident occurred; no such "shocking video footage" exists. 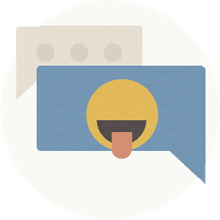 The above post and others like it are bait for a clickjacking scam in which users who click on the links are redirected to pages outside Facebook and tricked into divulging their log-in information (email address and password), enabling scammers to hijack their accounts. Some versions claim 4 people died; others claim 17 people died. Some feature a doctored image purporting to be a screen shot of the video footage. The specifics vary, but the scam is always the same. All social media users should be wary in general of lurid come-ons purporting to link to "shocking videos" or "breaking news" about catastrophic events, celebrity gossip, etc. They're almost always scams. Clicking on them can put the security of your account and computer at risk. Think before you click. Never click suspicious links, even if they come from a friend or a company you know. This includes links sent on Facebook (ex: in a chat or post) or in emails. If one of your friends clicks on spam they could accidentally send you that spam or tag you in a spammy post. You also shouldn't download things (ex: a .exe file) if you aren’t sure what they are. Never give out your login info (ex: email address and password). Sometimes people or pages will promise you something (ex: free poker chips) if you share your login info with them. These types of deals are carried out by cybercriminals and violate the Facebook Terms. If you're ever asked to re-enter your password on Facebook (ex: you're making changes to your account settings) check to make sure the address of the page still has facebook.com/ in the URL.